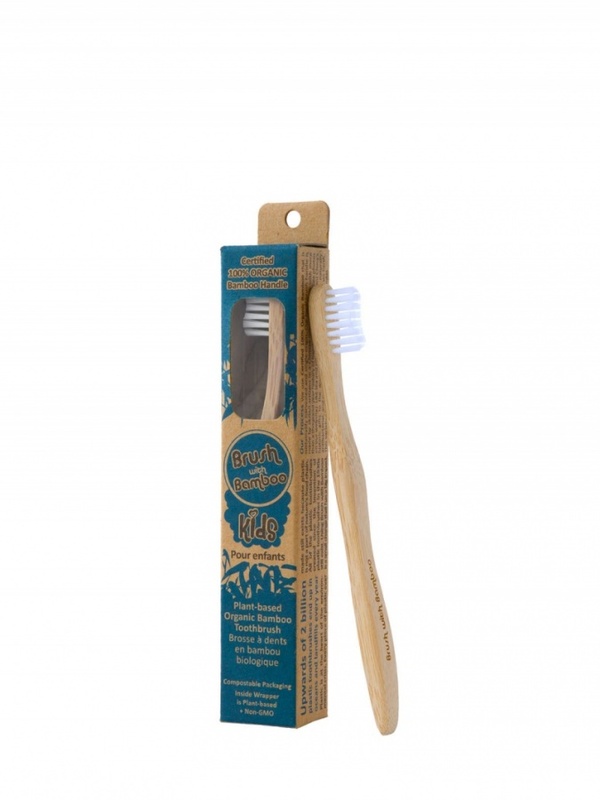 A plant based bamboo toothbrush for Kids. The handle is made from certified 100% organic bamboo. The soft bristles are made from a base of 62% castor bean oil (Certified bio-based). The wrapper around the toothbrush is plant-based and home compostable. BPA-Free, Vegan, and Verified Non-toxic. This kids bamboo toothbrush has a biodegradable handle made from certified 100% organic bamboo (certified by CERES of Germany). The soft bristles are made from a base of 62% castor bean oil (Certified bio-based). The wrapper around the toothbrush is plant-based and home compostable. BPA-Free, Vegan, and Verified Non-toxic. Note: Some adults prefer to use a smaller toothbrush. This toothbrush can be used by adults too.